There are plenty of hot-button issues in the the essential oil community. One of the biggest, hottest, buttoniest issues is lemon oil. Specifically, is it safe to ingest lemon oil (or any other citrus oil)? Take a minute to Google, “Dangers of ingesting lemon oil,” and you’ll find articles with a whole range of opinions. Some say to never, never, never ingest essential oils of any kind. Others advise caution and say it should only be done under the care of a certified aromatherapist or only for a short duration. Still others include very scary stories about about what could happen, or say things like, “Lemon oil is a solvent! It will dissolve your insides!” Sometimes they show pictures of lemon oil dissolving Styrofoam as proof of its danger. Many are outright hostile to multi-level marketing companies (at least the ones they don’t belong to), as if the organization of the company somehow determines the safety and quality of the product. If the main compound in lemon oil is a popular dietary supplement, why are we afraid of lemon oil in our water? Unfortunately, there aren’t a lot of studies out there researching the safety of ingesting lemon oil. It’s just not a big enough deal for the powers-that-be to study. However, there is something that has been studied quite a bit–not just for safety, but also for it’s benefits: limonene. 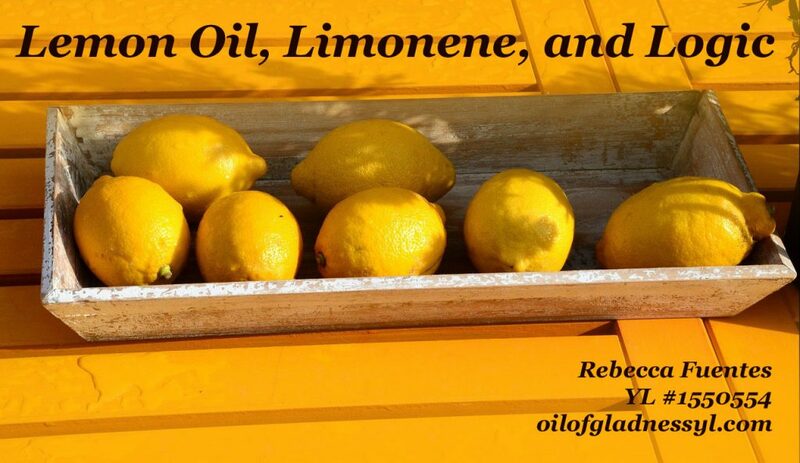 Limonene is the main chemical found in lemon oil, orange oil, and other citrus oils. High quality, pure lemon oil is 59-73% limonene. Orange oil is even higher, at 85-96% limonene. Before there’s any hyperventilating about limonene being a chemical and OMG there are chemicals in lemon oil, recall that water is also a chemical (and a solvent). Chemical-free is a nice catch-phrase for getting harmful chemicals out of our lives, but we all know life can’t exist chemical free. We need all sorts of chemicals to survive. Iodine, for example, is a chemical element, the heaviest of the stable elements called halogens, and we need it. So yes, limonene is a chemical, a compound made of 10 carbon and 16 hydrogen molecules. It is classified as a hydrocarbon (because it’s made of hydrogen and carbon atoms). Due to its high levels in lemon and other citrus oils, the question of lemon oil safety can be restated as: is limonene safe to ingest? Limonene is available in both industrial grades (often mixed with other chemicals to enhance effectiveness) and food grades. Food grade limonene is on the FDA’s “Generally Regarded as Safe” (GRAS) list, which lists additives and chemicals that can be used for flavoring or as ingredients. If you pick up orange-flavored gum, a baking mix, or lemon pudding, there is a good chance it has limonene in it. So in very small, diluted amounts, as are used in foods for flavorings, limonene is safe. But as people point out, that’s different than undiluted limonene (or lemon oil) in your water glass. After all, industrial limonene is commonly used as a solvent for oils and grease in cleaning products. It is used in paint strippers and removers. Lemon oil has removed the finish from my bathroom cabinet, as well as fingernail polish. How can something that dissolves plastics and petro-chemicals as well as nail polish and furniture finish be safe to ingest? Companies who add limonene to their solvent formulas use it precisely because it is a much safer option. It’s not only produced naturally –since it comes from the peels of oranges, it is a by-product of making orange juice–but it ranks very high as a safe product. Long-term exposure to large amounts of industrial limonene can cause irritation to the skin and respiratory system, and can produce a sensitivity to limonene in general. However, these are the effects on people who are either working to produce limonene or who use it in large quantities to clean grease or strip paint, etc. This is not a side effect of being exposed to one to three drops of lemon oil and it’s limonene . In addition, limonene is sold as a dietary supplement. Numerous supplement companies list several health benefits of ingesting limonene–everything from supporting a healthy digestive system to protecting against cancer. I’m not going to talk about any health benefits of limonene here–that’s at your fingertips with a simple Google search. Dietary supplement doses are usually 1000 mg, a full gram. That’s far more than the limonene found in one to three drops of lemon or orange essential oils. Yet this high amount is safe. Studies available on PubMed describe using both lemon oil and limonene internally. I can’t link them (FDA compliance rules again), but I will say, they don’t indicate any dangers from the ingestion, even when taken daily for a year. Ingesting limonene (and citrus oils) is safe, if it is dietary supplement quality. Don’t be scared by this picture! The limonene in citrus oils dissolves Styrofoam because they have similar chemical structures. In chemistry, structure is as important as content. But what about that Styrofoam plate? Well, styrofoam has a very different chemical make-up than humans–it’s a hydrocarbon. Limonene is also a hydrocarbon, and in chemistry, like dissolves like. Limonene and Styrofoam are both made of carbon rings with a double bond, which allows the limonene to dissolve the Styrofoam. Just like some things are water-soluble and some things are fat-soluble, hydrocarbons are soluble with other hydrocarbons if they have structural similarities. Limonene is a very safe hydrocarbon. It’s why limonene-based cleaners are often preferred by artists working with oil paints. Other hydrocarbon solvents are often quite damaging to the skin, dangerous to use in enclosed spaces, and a severe poisoning risk. Limonene does not pose the risks of turpentine and other hydrocarbon solvents. We can’t make sweeping statements about the safety of hydrocarbons because that’s a wide array of compounds, with a wide variety of effects. Gasoline is also a hydrocarbon, but they are not equal! Guess what doesn’t have a carbon ring with double bond in it? The human body–and it means that the human body is not limonene-soluble. Neither limonene nor lemon oil will dissolve you. Human flesh and internal organs are far, far more complex than hydrocarbons. Our stomach contains and uses gastric acid. Gastric acid has a ph of 1.5 to 3.5. The lower the number, the stronger the acid. Vinegar, which is acidic enough to be uncomfortable if we drink it straight, is 2.2. Lemon juice, which people add to their water at restaurants, has a ph of 2. People take hydrochloric acid pills to help increase stomach acid! Vinegar, lemon juice, and stomach acid all have a big effect on plant and animal materials like egg shells, banana peels, meat, and lettuce. Lemon oil . . . not so much. It doesn’t even have a ph, because ph is a measure of water-soluble compounds. Soak a hunk of meat in a strong acid or base, and it will dissolve over the course of many hours, but soak it in a hydrocarbon and it is unlikely to dissolve (it will become flammable, though, and possibly inedible). 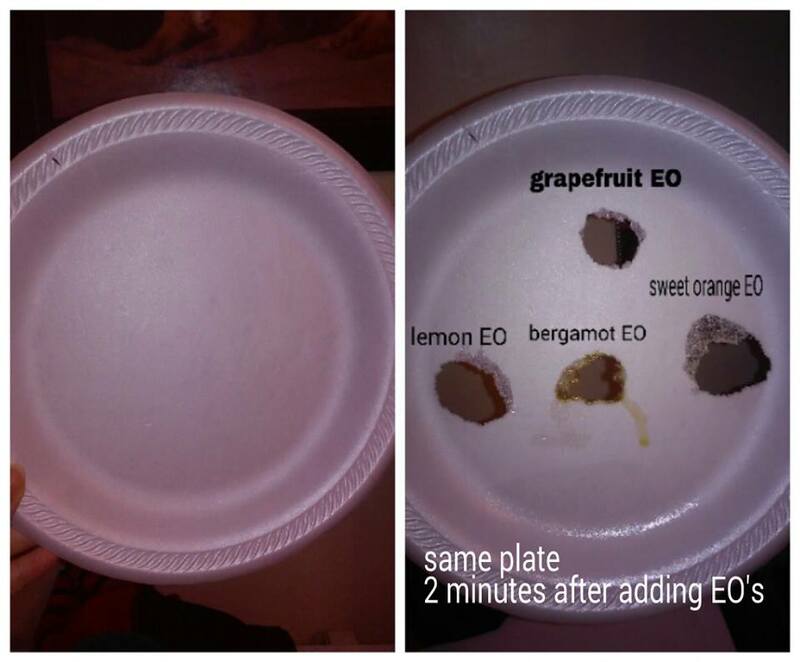 When supplement grade limonene is ingested, the stomach does not dissolve; neither does the throat, or the mouth. Limonene does help break down cholesterol that has been ingested. Medically, limonene has been used to break down cholesterol-based gallstones. So for a recap: lemon oil is mostly limonene; limonene is not just safe, but possibly beneficial, to take internally–it’s a popular dietary supplement; limonene dissolves similar hydrocarbons, not human flesh. If someone is uncomfortable using high quality citrus essential oils in their water or cooking (and I only use and recommend Young Living essential oils for anything! ), then don’t use them. But don’t use scare tactics that aren’t supported by research or chemistry to smear people who do. I consulted a chemist and a chemical engineer whose focus is environmental safety for this post. Limonene, and the citrus oils that contain it, are quite safe to ingest if they are dietary supplement quality. Use a glass or stainless steel container, so your limonene isn’t hanging out with other hydrocarbons.